Maghreb Blog: Tunisia's "Will of Life"
** This is my latest piece for the Huffington Post's World Post. Since the publication of the article, Tunisia's President Beji Caid Essebsi declared a state of emergency in the country for 30 days. In a televised speech Essebsi cited reasons of national security and stated his concern that the government "would collapse" if there is another terrorist attack. Tunisia is a nascent democratic experiment, and such premature state of exception and the vast autocratic measures contained in the emergency powers could be detrimental to greater institutional development, individual freedom, and press liberty. A century after al-Shabbi’s poem, a minority of radical Tunisians have instead embraced death and have sought devastation in their quest to establish a murderous fictitious Islamic state. The whole world seems to be firmly in the crosshairs of radical Islamists inspired by the extremist ideology of the Islamic State. The attacks on a beach resort in Sousse that killed 38 people were part of three terrorist attacks in three continents. The first was a suicide bombing inside a Shi’a mosque in Kuwait as worshippers were gathering for the Jumu’a prayer, killing 27 people, while the other attack took place at a gas company in France where a seemingly disgruntled employee decapitated his employer, and injured two others. These acts are not the work of lone wolves, or isolated acts of madness. The radicalism of the ISIS’ death cult has been the unifying ideology in all three acts. Despite the air strikes and active fighting in Iraq and Syria, ISIS murderous strategy to wreak “havoc” in the region through preaching and inspiration constitute a real threat for much of the MENA, and the Mediterranean region. Tunisia could have tightened security measures after the March 18 attacks on the Bardo museum that killed 21 people, but it is difficult to prevent such attacks on soft targets. The government has reportedly beefed up security protocols around hotels and tourist complexes, and some tourists have even complained of heavy security presence around the same resort that witnessed the attacks. However, recent reports also raise serious questions about Tunisian security readiness and response. Tunisian government and security forces have been criticized increasingly for their failure to adopt a comprehensive security strategy. A comprehensive counter-terrorism strategy would have to start at the borders with Libya. The neighboring Maghreb state has for the last year descended in utter chaos with more than a thousand active armed militias are fighting in an endless war of attrition. Libya has also been a major hub for terrorist training. The Bardo museum gunmen received training in Libya, and early reports suggest that the Sousse terrorist may have traveled illegally to Libya where he trained on the use of assault rifles. More importantly, there is a malaise inside the Tunisian society, a nascent democratic state, with deep societal cleavages and an identity battle between secular and religious trends within the country. Tunisia is at once a ray of hope in the menu of Arab uprisings failures, but a society that has contributed more than 3000 foreign fighters to the Islamic State. The legacy of secular policies, the repression of the religious impulse in the country in post-independence Tunisia, and the fragile security situation in the post-Arab spring have produced deep struggles between forces of secularism, religion, and radicalism. 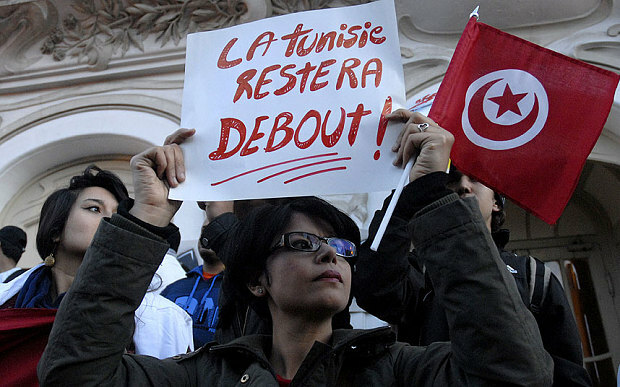 The electoral victory of secular Nida’ Tounes in October 2014 may have also served to radicalize more young Tunisian inspired by takfirist ideologies of the IS and al-Qaeda. These struggles are apparent in the complex identity profile of an increasingly violent minority of radical Tunisian youth. Seif-Eddine Rezgui, the gunman responsible for the Sousse attacks, is a case in point. The 24-year old electrical engineering graduate student, was an avid break-dancer, a member of a breakdancing club, and was arrested once for consuming hashish. However, reports also sketch another side of the gunman, who frequented radical mosques in Qairouan, made a number of public statements of commitment to Jihad, support for the Islamic State, and his favorite soccer team Real Madrid on his Facebook page. The complex profiles of these young terrorists further complicate the task of security forces to combat these types of attacks. The profile of the gunmen also reflects the underlying socio-economic factors for radicalism among the youth. Unemployment and bleak economic prospects are key causes for joining the call of violent extremism as one alternative to clandestine migration to Europe. Alienation, and hopelessness of the youth explain the large number of North African fighters in Syria and Iraq. A “noble” cause in the extremist minds of these “soldiers of despair” is worth dying for, when there is nothing else to live for. The threat of radical Islamism is a scourge amongst all Muslim majority, and increasingly minority, societies. The rather successful nefarious use of social media by ISIS and extremist Islamists makes is difficult to prevent such attacks on soft targets. While these are the acts of isolated individuals, the fact that they are inspired by an ideology and a mode of violent thinking do not make them lone wolves as some argued. This radical ideology is in fact a cancer that has been metastasizing far too long, and is arguably the greatest and most pernicious threat facing the religion and people in the Muslim world. An effective strategy against radicalism in the Arab and Muslim world would be to confront head on these ideologies not only in terms of security protocols, and economic reforms, but also discursively. A discursive strategy that embraces peace, not war and devastation, and seeks life, not death, as al-Shabbi rhymed a century ago in Tunisia.